Replicawarehouse supplies replica, original and reproduction historic objects of every imaginable kind including: weapons, armour, food, clothing, tableware, furniture and a wide variety of related artefacts of periods ranging from ancient Greece to World War Two and beyond. Replicawarehouse uses an extensive database of suppliers and craftspeople to supply specifically tailored replicas and reproductions to suit the individual needs of customers, whether this means museum-quality, highly accurate copies for gallery display, or tough and practical artefacts for education, film or TV work. Beyond even museum-quality reproductions, we can in many cases supply original items where that suits client needs. Our close working relationship with specialist suppliers enables us to satisfy your particular requirements, saving you the time and frustration of searching for suitable sources yourself. To this we add value by providing a comprehensive service, offering not only historic items themselves, but advice on displaying them in context, plus an installation service to put your display together. Lesley Edwards is a social and economic historian with a wide interest in the artefacts (e.g. pottery, tableware, furniture, kitchenware, food, art, scientific instruments, arms & armour) which relate to life in past periods. 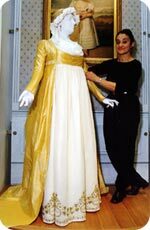 She is one of the UK's leading costume experts, with experience in all aspects of making replica historic costume, especially for museum display and educational purposes. She is a university lecturer, and a TV and radio consultant and presenter. Lesley is a also a freelance lecturer, presenting - with slides or costumes - at all types of functions, and she is an entertaining and amusing after-dinner speaker. Her audiences include academic societies, fine arts groups, luncheon clubs and business conferences, and her style and range of talks is adaptable to suit the occasion. She has spoken at venues of all types, in England and the USA, including historic mansions, Hampton Court Palace, Lambeth Palace, and the Victoria and Albert Museum..
HMS Victory, Royal Naval Museum Portsmouth, English Heritage, The National Trust, The Museum of London, Ferens Art Gallery Hull, Manchester City Art Galleries, National Maritime Museum Cornwall, Madame Tussauds, The Royal Armouries, The Honourable Artillery Company, The British Museum, The British Empire Museum, HMS Trincomalee, Channel 4, BBC, ‘Star Wars’, ‘Pride & Prejudice’, ‘Emma’, The Globe Theatre, Glyndebourne, Tameside MBC.